The insuperable 2017 Pipe Masters thread! Nice conditions this morning with light variable winds and solid waves. WSL calling 6-8ft surf, expected to ease throughout the day. Jeez, Backdoor is looking pretty good. Makia McNamara just scored a filthy wave. Looks like they may go on hold first thing or run............locals don't actually like to surf pipe on a rising swell especially with a lower tide. Layday call and it's the right one. 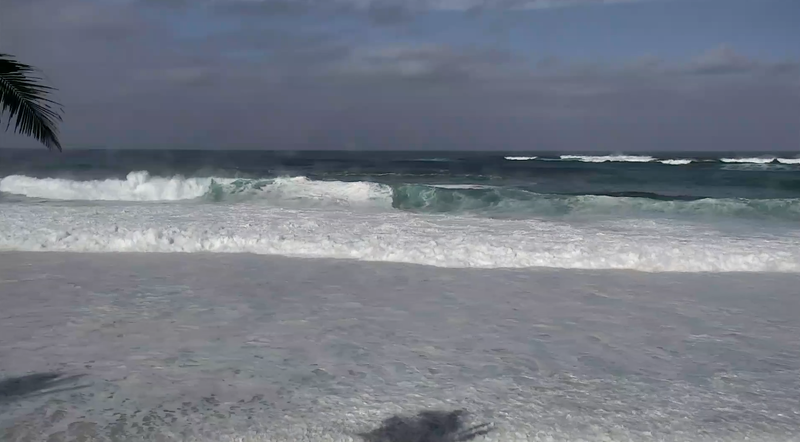 There's no-one out, the swell is junky, and aleady there are outside reefs flaring around the place. Hard to tell where the Pipoe lineup actually is. Gums invitational.............that cam looks straight at off the wall. It's either on the BB house or on the house across from the entry to OTW. Plenty of sand still hanging around . Would be nice to see it from the volcom house steps. Used to sit there and watch it when it was really big. The big swell the night before the 2013 contest was pretty radical to watch form . it started the day before at 1:30 in the afternoon. By ten at night it was was washing up the bike path OTW and washing out towards KAM highway. The swell peaked about 1 am and settled for the morning. I remember waking up and walking down between the volcom houses. It was big and really consistent. The swell had washed the beach way back, I was surprised to see the contest scaffolding still in place. Only just managed to tune in, looks pretty ordinary with that light to moderate onshore. Lots of crumbly sections. I assume it was much better earlier? Kelly Slater is surfing at 65% with his injury, or so he said in the post-heat interview. The commentators have latched onto that number to discuss his chances in the comp and Pottz has been repeating it but often without saying "percent". So it's "Slater at 65 is still better than most surfers at Pipeline." Which doesn't sound that far-fetched considering the way the old fella is going. Yeh, it was better earlier. As long as it's barreling, Slater can win. And we're back on. Looks like average D'Bah. Yup, pretty underwhelming. Anything interesting on the cards? Nothing I can see (though I haven't been paying close attention to the North Pac synoptics). Main issue we have right now is that we won't see a return to the trades throughout the rest of the window, and this seems to be the primary factor in determining surf quality (irrespective of how much swell is on offer). So, they'll be cherry picking opportunities over the coming days. A new swell is expected tomorrow afternoon and through Monday (local time) but it's gonna be patchy. Shame would've been good to see the showdown in quality waves. Highlight so far was seeing Strider having to scramble, hopefully not back to onshore tomorrow when the swell hits. Attenborough doco about bioluminescence on the box and with Turpel settling in that's my cue. ... and they’re back on Standby. Sad thing is it’s likely to come down to a lot of luck. How long since we’ve had solid waves for pipe? "Sad thing is it’s likely to come down to a lot of luck. How long since we’ve had solid waves for pipe?" Pottz has got a new marker pen. And someone's finally told him that taking a new approach isn't a 360 degree direction change. ...still calls everyone under the age of 55 a 'kid'. I reckon Ethan got JJ but that wouldn't bode well for the 'Showdown at Pipe'. I agree he got him. Tense moments. Just watched the heat replay of Kerrsy v medina. They edited it to show 3 incomplete waves from medina so which one got a 3 something to put him in front?? JJ v EE was 50/50 either way. Medina got the 3.43 for 2 backside snaps, considering the waves it was fair. His backflip was cool but glad the judges didn't reward it. more interesting to keep some people moving on. Oleary gets a 6.5 for a very simalar barrel and a massive air. I cal Medina overscored. I also have my doubts about JJs win. I don't think you can directly compare the scoring between different heats. Ideally, yes, but that never seems to work. More than all the scoring issues, I think today's main question is: Is Jordy just not intelligent enough to be world champ? He seems to not really want it, or to not be able to think straight. He's massively talented, but I can't remember the last time I got excited seeing him surfing. A paling, injured Slater versus crazy hungry Medina in a crucial heat at four foot Pipe? Hard to give the goat even an echo of a chance. Looks like its luck of the draw for finals day. Intriguing match up, give him the benefit of the doubt - fecked foot fall. Medina all over it at the mo though. That claim in front of Kelly added a cpl points IMO. OMG how over scored are Medinas waves in these last two heats. The wind is now swinging. This aint just gonna be a win, it's gonna be a confidence boosting win. Based on what everyone else has been scoring for similar barrels this event, way overscored. They've been keeping heaps of room in the scoring all event, but not this heat. And he didn't need the overscores to beat Kelly anyway. Ah Slater had a turtles heed to deal with. I will repeat myself when I will clearly state Medina is being overscored again. the surfing world hates Brazzos. Medina still waits down the line out of position with the pure intent of blocking anything that looks like a decent score. And then throws out the arms asking for an interference as he fades back to the foam? Hasn't become more likeable since that heat at Bells against Bede all those years ago. That's it eh? The block aint enough, gotta turn back inside and complete the act. It's great to have a villain! Slater has easily been the biggest prick to surf against for decades; very pleased to see Medina beat him at his own game. Don't think it would've made any difference even if slater got a 10 for that wave but dropping in purely to block with no attempt at a score doesn't seem right. Can't remember properly, but when Slats dropped in on Parko at Snapper, was he waiting down the line to block or sitting in that position generally or paddling back out? I was just thinking that Parko might be chuckling quietly. Parko paddled up the line from KS, which was a questionable move as he didn't have priority - only ever gonna end one way. I've got no problem with a priority block but Gabs has a chronic issue with not just dropping in but turning back towards the rider already up. He's done it with Bede at Bells, Glenn Hall at Snapper, and he did the same today. The priority rule was amended last year and I wouldn't be surprised if it gets sharpened up again. The person without priority is still allowed to surf and be scored, while the person with priority shouldn't totally sacrifice a wave to interfere with non-priority scoring. Think if someone takes off and goes left at J'Bay to quickly shut down a non-priority rider. Hope not but think JJF might come unstuck here.